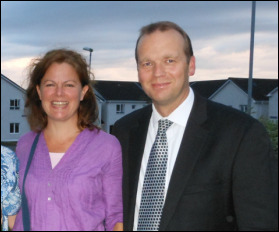 Keith & Candace Malcomson have ministered in Limerick since 2005 at church meetings, conventions and short-term Bible Schools. After thirteen years of constant travelling in ministry to preach and teach the Word of God in Europe and other nations, as well as to train leaders for ministry, the Lord called them to start a new church here in Limerick. Since 2005 they have also run a three week Bible school, each summer, in Limerick, when students have gathered in from more than twenty countries to be taught God's Word. Keith's Grandfather was converted under the preaching of an Evangelist from Waterford in 1959. In the following years his grandparents would take new converts from Dublin - some of whom had been drunkards - into their home near Dromore, County Down, to disciple them and teach them the things of Christ. His parents made a number of trips south to carry the Gospel to those in need. Since the early 60's his mother has prayed for a genuine revival to sweep across the whole of Ireland. Keith is originally from Banbridge, County Down, but has lived in several different countries while ministering in churches over the past twenty years. He has functioned in a great diversity of ministries with broad spiritual experince amongst Pentecostal and Evangelical churches. His chief desire is to know and glorify Jesus Christ and to make Him known to others. Candace is originally from Durban, South Africa, but has lived in Ireland since the year 2000, when she came to the country to take up a position in music education. When they were married, she left her career to be Keith's Helpmeet. Both are published authors and they continue to work on material yet to be put in print. Keith and Candace are presently giving themselves to the task of raising up this new church in Limerick City. Through the regular preaching and teaching of the Word of God they seek to see souls saved, believers sanctified, and a church brought to maturity in Christ which will glorify Him through walking in true holiness as a witness to His resurrection. They carry a strong vision, burden and prayer for a Heaven Sent Revival. Nothing else will meet the need in Ireland than a genuine outpouring of the Holy Spirit.